The national Union of Rail, Maritime and Transport Workers (RMT) and the Transport Salaried Staffs Association (TSSA) have announced strike action for four days, from Tuesday 6 to Friday 9 April. This means that Network Rail signallers and maintenance union members will not be working during this period. This will have a significant affect on the services Southeastern are able to run. Click here to read the revised timetable. As you know the strike is the result of industrial action by signal workers belonging to the RMT union employed by Network Rail. The revised timetable is based on Network Rail’s estimate of the number of non-union members and trained managers able available to work on strike days. Trains will be of maximum length in accordance with the infrastructure available. We are very sorry for the obvious inconvenience that will be suffered by our passengers and hope that a resolution can be reached. At the time of writing I understand that Network Rail has gone to court in a bid to have the strike declared unlawful on the grounds that they there may have been discrepancies in how the ballot was conducted. Update #2 – Breaking News: The strike is called off. The News Shopper has the story that Southeastern has replied to the Chair of Transport Committee of GLA Caroline Pidgeon AM that requested the company an explanation for the three days of railway mayhem at the beginning of January. Here’s the original letter in full, it’s an 11 pages dissertation of the company Managing Director Charles Horton where he explains why Southeastern decided to operate the way it did. Frankly it doesn’t explain convincingly why it didn’t operate a better service. In times of service disruption, it is Network Rail’s role to coordinate the industry’s response. Based on a detailed forecast predicting adverse conditions, together with dialogue from Directors at Southeastern it was my decision to request Southeastern to operate an amended timetable for the 6th 7th and 8th January. My decision was based on the forecast of adverse conditions, the challenges posed by operating electrical rolling stock on an infrastructure susceptible to rail icing and lessons learned from the 18th December 2009 where upon operating a full timetable in adverse conditions we experienced multiple train failures often leaving passengers stranded on freezing trains for long periods. It is the responsibility of train operators to put together an amended timetable, and on this occasion the timetable specified by Southeastern offered services into and out of London for essential travel based on resources available to Network Rail and Southeastern. We will jointly be reviewing the service on 6th 7th and 8th January including the service levels and hours of operation so that we can learn lessons, should the condition repeat in the coming year and beyond. I must assure you that my decision was not taken lightly, and was done to maintain our duty of care for the travelling public and the industry workforce. So here you have it, Network Rail has all the information to assess what they and Southeastern can deliver and given what they knew they decided that a reduced timetable was best advised, but the extent of the reduction was completely down to Southeastern and despite the length of the response Charles Horton fails to convince that stopping service out of London at 8pm was needed. His assertion that the amount of service was measured against the reduction in demand on days with adverse weather also clashes with passengers’ experience that found trains overcrowded and insufficient to serve all those that were present at platforms. We need to change the way this system operates, we need transparency, even in operational decisions, so that next time a reduced timetable is needed, it is measured against the need. In the past few years large subsidies were handed out to Southeastern, and large dividends were distributed to the shareholders, if the capacity to run better services in adverse condition is not there then it means that shareholders may have helped themselves above what they should have, even at the cost of the company’s capacity to respond to not ideal situations. All the reasons given by the Managing Director for the decisions they took bring back to one overarching consideration, the same consideration that Network Rail did, that the capacity of the company falls short of what’s needed to run a full service in bad weather. Another reason to sign our petition. Lib Dems didn't reduce service because of snow. Petitioning at Hither Green Station. From left: Pete Pattison, Halina Bowen, me. This Monday 18th January Southeastern Railways wrote to the leader of the Lewisham Lib Dem group Cllr Chris Maines, the letter had a title written in bold characters: Liberal Democrat Petition! In the letter Southeastern proposes to meet with us for discussions, and so on Monday night me, Tam Langley and Chris Maines met and decided our platform of requests for Southeastern. We decided on a number of issues to raise, including refunds to season ticket holders, but we also agreed on a very important central point that we need to make, that we need confidence in Southeastern’s ability to deliver a dependable service and this is only achievable if the traveling public (I hate the word “customers”) are allowed to question the company’s operational decisions. We need a voice of the stakeholders that is kept informed and has weight. Something that does not exist in the current set up. The terms of the franchise agreement between the Department for Transport and Southeastern is such that for the next few years Southeastern will receive progressively decreasing subsidies, the subsidy was £136m last year, it will be £116 for the year starting on 1st April 2010, dropping further to £71m for 2011, then £24 for 2012 and ultimately becoming a premium to pay to the Government in the last year of the contract when Southeastern is supposed to give back £18m. Operating profit* was below the exceptionally strong result for last year but broadly in line with the franchise bid. This was partly achieved through a significant cost savings programme which Southeastern started in the first half of the year, including a reduction of up to 300 positions which incurred an exceptional charge of £1.9m, procurement savings and other efficiency savings which in total are estimated to have saved nearly £10m compared to last year. These numbers scream one word: warning! In the good years large subsidies have been transformed into dividends for the shareholders and when the subsidies decreased workforce was instead sacrificed to provide a profit, but the margin is reducing and if this trend continues Southeastern at the end of the franchise will have neither money nor men and it may return to the Government a dead horse. The recent decision to run a reduced timetable for adverse weather forecast is in effect a self-audit. The company showed no confidence in its own capacity to sustain the service. Where in the past an adverse weather forecast would have moved management to decide for increased trains on the track to prevent ice from forming, this time it decided for reduction of service. This went against industry standard practice and the fear is that it did so because it didn’t have the capacity to adequately respond to an adverse weather situation and knew it. The original sin was obviously that of the Labour Government that set up an agreement that doesn’t deliver enough for the traveling public and apparently only makes it worthwhile for the franchisee if costs are cut to such a degree that the system starts to creek (although the past large dividends may say another story). Recently Southeastern delivered increasingly poorer results both in terms of punctuality (90.8% in 2009, was 91.1% in 2008) and customer satisfaction (76% in 2009, was 79% in 2008), this affair of the reduced timetable is just the straw the broke the camel’s back. We need a review of Southeastern’s working practice to happen transparently and with the involvement of the traveling public. We must regain confidence in our train service. The company is due an explanation to the GLA transport committee, and crucially is due a renewal of the contract in 2012, something that it should not take for granted (link) . It’s time to put maximum pressure to bring some positive change to the way it operates. The issue must not drop off the agenda, that’s why we Lib Dems will keep on collecting signatures on our petition that asks Southeastern to recognize the poor performance and apologize by giving the equivalent of three days of subsidies to Network Rail. Despite the fact that service level has dropped this year shareholders will receive a dividend and managers a bonus for delivering a profit. By signing the petition all those that have been let down can unite their voices and deliver a strong collective message to Southeastern. Our initiative is working! The message already reached the intended ears and Southeastern now invited us to talks. It’s of capital importance that these talks are meaningful, we must keep up the pressure now, the petition goes on. Last week I spent twice two hours outside Hither Green Station with a campaigning table and a clipboard and collected hundreds of signatures. I spoke with many that lost days of work and even days of wages. We must act if we don’t want to see this situation repeating and the service deteriorating. We just cannot afford it. If you have something you would like me to say back to Southeastern in response to any of the paragraphs above, please comment on this post, giving the paragraph number(s) you’re responding to along with your comments. The more of their excuses we can collectively demolish with our combined expertise, the better! I think that it’s fair to say that the crucial technical information to answer back to Southeastern was provided by the transport anorak, hack and Greenwich Council Green candidate Darryl Chamberlain, so today Bexcentric published an update to the original post with the results of this appeal, the letter that takes to task Southeastern for its claims. Go and read it. This is one of those fine examples of collaborative blogging and it rather tears into pieces Southeastern’s claims of being innocent victims of events. Last week’s three days of disruption were the result of managerial choices, not of natural events. More reason to sign the petition. These days the Southeastern Railway website opens with a photo of a man holding an enormous watch in front of his face, the caption says “it’s time for change”. At seeing it many will think “indeed”. There’s a widespread feeling among South East London commuters that last week suffered the consequences of the 3 days of severely reduced timetable, they feel badly let down. 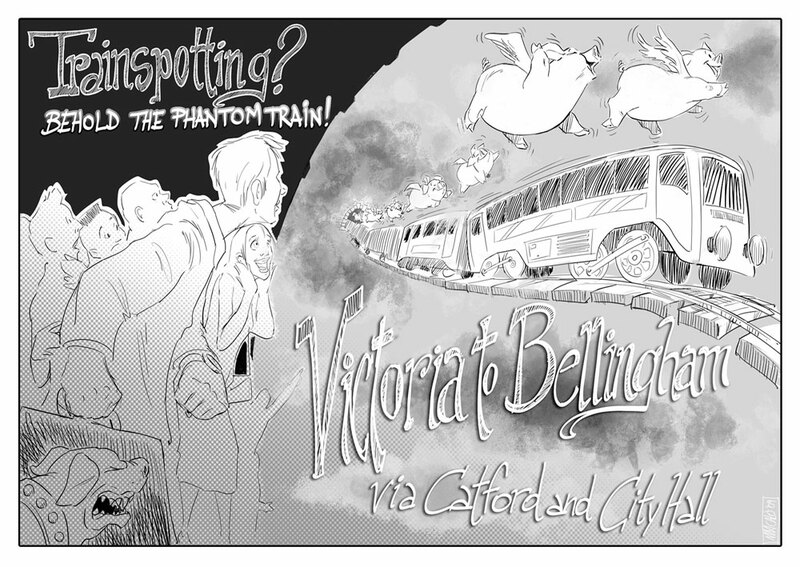 As freight and high speed trains were running seemingly as normal, commuter trains operating on the same lines were few and far between and so overcrowded that one could hardly fit in, if at all. Many couldn’t go to work, self-employed lost income, countless trips had to be cancelled. Central London was almost out of reach from many areas of South East London and Kent. It wasn’t an exceptional weather, temperatures were just below zero and only a few inches of snow fell over a few days. That’s a normal winter weather, as normal as it can be, and services should be able to stand that. Southeastern underperformed so badly when compared to all other operators around London that measures must be taken. That’s why the Lib Dems are now collecting signatures on a petition that aims at giving a strong message to Southeastern: put your house in order! When a company accepts a £136m public subsidy to run a public service it must provide the service all year round, it must have measures in place to run the service in normal winter weather and since the railway is an essential and strategic service it must be prepared to make an effort even when providing the service is not easy. Last week Southeastern threw in the towel even before the match started. Today we ask Southeastern to return a share of that subsidy equivalent to 3 days of service (£1.1m) to Network Rail to be invested in improvements at stations served by Southeastern. It’s a practical way to compensate those that for 3 days have been inconvenienced and to publicly acknowledge that it must do better if it wants to keep on running this strategic public service. Please either download the petition sheet, print it and collect signatures at your workplace, home or at the station or sign online. Improve your train service. A few days ago I received from TfL the reply to my enquiry about the Courthill Road junction and you can read the full letter here. The number of collisions is higher than we would expect for a signal controlled junction similar to this in Lewisham. Our latest personal injury collision statistics up to the end of June 2009 indicate that there have been 19 injury collisions, in the last three years, with pedestrians having been involved in four of these collisions. I do not believe that the accident you mention in your letter that occurred in April is included in these statistics, for reasons that are not at all clear, but this would bring the total collisions to 20, with pedestrian collisions rising to five. These would appear to have occurred on all arms of the junction and we are therefore focusing our attention on seeking ways to improve pedestrian facilities for the whole junction, not just Courthill Road. First of all the fact that 8 months after this accident happened TfL still has no record of it is a very worrying thing that casts a doubt over the reliability of their statistics altogether, especially in absence of an explanation. Still, they have on record 20 injury collisions in the past three years alone, and 5 of these involving pedestrians! Isn’t that enough? The fact that there are queues on all the approaches to the junction during peak periods with the current traffic signal operation is a clear indication that this junction is operating at its capacity limit. To provide pedestrian signals we would need to shut the entire junction down for traffic to enable pedestrians to have a free period to cross or we would need to re-phase the traffic signals and provide wider pedestrian islands to enable pedestrians to cross all arms of the junction at different times without being opposed by vehicles. If all traffic movements were to be permitted both of these options would have a significant impact on the amount of time that traffic currently has to move through the junction. Clearly, there is a balance to be struck between the competing modes and it is important to understand that we, as a public authority, are governed by a number of other, sometimes conflicting policies, one of which is an initiative to “smooth traffic flow”. This seeks to reduce the delay and congestion along the Mayor’s network and presents particular challenges when the task is trying to integrate signalised pedestrian crossings into congested junctions like this one. That’s the key, they want to help traffic flow, and pedestrians get in the way. Or so they think, only that it’s nonsense, because as I already said in a previous post the context of this junction is not a flowing route, this is between Catford and Lewisham. Traffic only flows to the next junction and it makes almost no difference whatsoever if you can go past this junction fluently in either directions because inevitably you’ll hit another one, and being this between Catford and Lewisham if you’re at peak time almost invariably it’ll be gridlocked. When it’s not peak time you’ll have instead a decent ride, what will one extra pedestrian crossing add? Not much, especially since they’re all request crossing nowadays. A tangent consideration here is due, two junctions down from Courthill Road there’s the Lewisham Station roundabout, that TfL agreed to redesign to allow the Lewisham Gateway development to happen. Now, I don’t think that there are many better ways to slow down traffic than to build a 20 storeys complex over a major roundabout. I remember that when the consortium for the Lewisham Gateway admitted that contrary to all they had said to that point the new layout would slow down traffic then all of a sudden the talk was about “capacity constraint”, now it was a positive and even green thing. Slowing down cars to convince drivers to get on buses and trains instead. Only that the traffic going through the Lewisham roundabout, as also Lewisham’s Head of Planning recently recognized, is not a locally generated traffic, is a traffic that only passes through here to go from somewhere else to somewhere else and there’s very little that can be done locally to discourage it and therefore we can imagine that slowing that junction, which is truly a key junction for the area, will lead to an environmental worsening for what air quality and noise are concerned across all the arms of the junction, which means up Lewisham Way, Loampit Vale, Lee High Road and upstream towards Catford including also the Courthill Road junction of Lewisham High Street. But that’s ok for them. A pedestrian crossing on Courthill Road instead cannot be done. We will continue to investigate whether we can provide pedestrian improvements but this process takes some time. To comply with the other policy objectives we must be able to demonstrate that the introduction of signalised pedestrian crossings will not have an adverse impact upon traffic flow through the junction. If we cannot demonstrate this then, it is unlikely that we would be able progress any pedestrian improvements. It’s taken them years to come to this point, where they know that there is a serious problem, they know that there are solutions and yet all they are prepared to say is that they’ll study the problem again! How can they ignore that this junction leads to another clogged up junction whatever way you go? They’re TfL, these are their roads, they surely know this. Why don’t they act? For TfL the Courthill Road junction is therefore primarily a place for traffic to flow and for us to keep on risking our lives, in other parts of London the other part of the strategy may apply instead, there they’ll be providing better, more attractive streets to encourage people to walk and lead active, healthy lifestyles. I’m not impressed. Last year I asked Lewisham Council’s Head of Highways about this junction and what he told me was that according to TfL statistically it wasn’t a very dangerous junction and as funds are limited (and shrinking) other junctions had to be invested on first and Courthill Road wasn’t likely to be sorted out anytime soon. But then TfL agreed to study the situation so that was a glimmer of hope. In that context this letter doesn’t sound good as it carefully avoids to commit to anything and specifically states that only if we don’t slow down traffic at all they’d provide a solution, which is obviously impossible because however minimal there would always be an impact, but it’s a compromise that we must keep on pursuing, because as TfL’s (possibly incomplete and completely contradicting what told last year to Lewsham Council) statistics now show, it is a dangerous junction indeed, and a strong case can therefore be made. and that’s what should be done here. 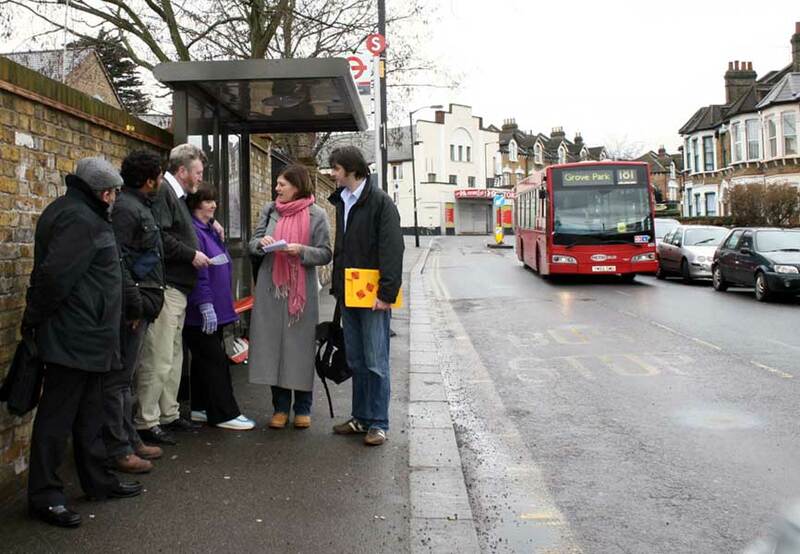 And if you haven’t done it yet then please sign the petition for a safe crossing at Courthill Road. Southeastern trains reduced also tomorrow. Why? Well, it has been snowing, but not exceptionally, nothing like it was forecast, and yet South East London commuters are faced with trains that are few and far between and so overcrowded that you can’t get on. The theory that’s been going around is that Southeastern is advertising an emergency timetable to avoid being liable to pay refunds and compensations in case of real severe delays because of weather do occur. If this was true then it means that this timetable was written by solicitors instead of engineers and what should be run as a service is instead run as a pure business with utter disregard for the customer they serve. “The decision to run a revised timetable was made based on the advice from Network Rail, who has responsibility for the track and they decide what service we will be able to provide. They were out overnight with de-icing trains and we also ran ghost trains around the entire network, not just in London. To ensure that we were able to provide a reliable service throughout the entire day and have the right staff and rolling stock in place for the evening peak, when the worst of the snow and ice hit London, we needed to run the revised timetable from the morning, as it would have been almost impossible to implement at the last minute for the afternoon. Our trains also come into London from across Kent where they will, of course, also be subject to the snow and icy conditions found there. We told passengers at the earliest possible moment on Tuesday of the revised timetable through texts, emails, station notices, onboard announcements, station announcements and providing extra staff at stations, as well as advising the media of the plans. I may be over-suspicious but to me this statement looks like it’s been written a tad too carefully, it doesn’t say for example that the decision was taken by Network Rail, only that it was “based on Network Rail advice” but what this advice was is not told. 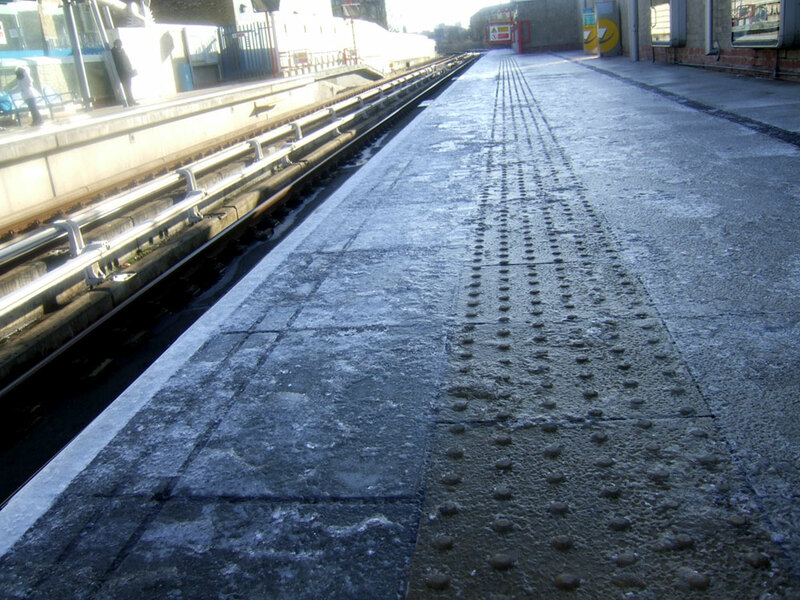 It says that Network Rail “were out overnight with de-icing trains and we also ran ghost trains around the entire network, not just in London” but doesn’t say that they found the network to be unworkable, actually, if you think about it, if they were out with de-icing trains it means that the track is fine. The whole statement to me only reinforces the suspicion that this timetable was indeed written by solicitors instead of engineers. I live close to Lewisham station. I think it’s strange Southeastern are unable to maintain a scheduled timetable yet freight trains have been thundering through Lewisham more or less as usual? Posted in locals, London, Uncategorized | Comments Off on Southeastern trains reduced also tomorrow. Why? If you agree that these points should be part of the level of service that we should normally expect then sign the petition. One thing I’d add to this list would be a replacement of the completely useless info boards at the entrance to platforms 1-6 at London Bridge Station (thanks Bruce). It is simply impossible to understand what platform one should go to and a lot of people have to go through the gates into the main hall, read the main board and go back through the gates again to platform 1 to 6. This creates unnecessary congestion at the Station and wastes a lot of time to a lot of people, often the crucial time that makes the difference between catching your train and missing it. One of the issues that affect many residents of Lewisham Central and users of Ladywell Pool is the devilish pedestrian crossing at the bottom of Courthill Road at the junction with Lewisham High Street. Recently a very serious accident took place there and a woman was run over by a car, she was badly hurt but fortunately survived. Do we have to wait for a fatality before a pedestrial traffic light is provided? Here’s a video I took a few months ago, it shows how in absence of a traffic light for pedestrians it’s actually near impossible to cross in safety. Cars can come at you from 4 different directions and as it happens most people have only two eyes. I’ve been crossing that road most days for about 11 years and I still don’t know which way to look. About halfway through the video there is a window of about 20 seconds where it is possible to cross, only that without traffic light one cannot know if it is safe or not and for how long, maybe cars are not coming from some direction not because traffic lights are holding them but because there aren’t cars from there in that moment. With so many possible ways to have incoming traffic it’s very difficult to understand that and it does happen that just as you start crossing someone speeds in front of you, you just cannot know, you can’t see their traffic light. Then just as the traffic restarts a woman wants to cross, notice how at first she is unsure about when to start crossing, and then after she starts crossing and reaches the middle of the road cars start to move, but again she cannot know if they’re going straight or turning into Courthill Road so she has a moment of hesitation and waits in the middle of the road with cars running near her until she finally finds the moment to cross the second half of the road. It’s crazy, that’s the normal way to cross Courthill Road. A few months ago me and Libdem Councillors Chris Maines, Andrew Milton and Dave Edgerton went to City Hall and delivered to Mayor Boris a 600 signatures strong petition asking him to give us the traffic light we need. 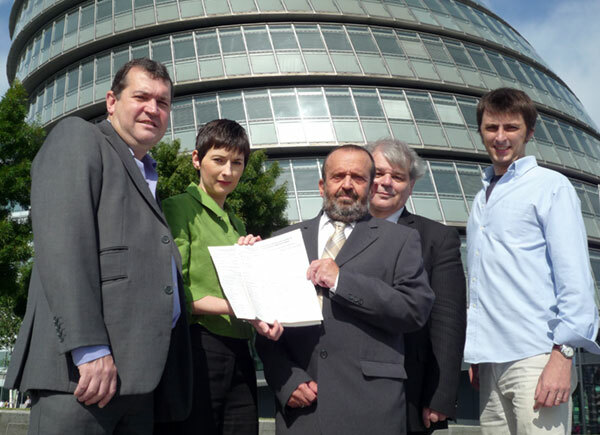 The petition sheets were handed in by Caroline Pidgeon AM who is the Libdem Chair of the Transport Committee of the GLA. We were then told by TfL that they were studying possible solutions but since a few months have passed and I haven’t heard anything about it I just sent another email to TfL asking for an update and I’ll post here any reply I receive. You can do the same by emailing to londonstreets@tfl.gov.uk and in case you have not done so yet you can add your name to our online petition, the more people sign it the bigger the pressure we can put on TfL. Oyster cards are arriving to the suburbian railways of Lewisham, Hither Green and beyond. But they come with a hefty bill, a bill you need a degree in billology to understand in full but in short means overall increase in fares, even higher fares for non-Oyster users (yes, there are those that don’t need an Oyster Card) and off peak, plus the introduction of a rather inconvenient system of Oyster Extension Permit for those with Travelcards wishing to travel outside the zones of their permits, something that will inevitably be felt more in areas like ours that are spread across zone 2 (Lewisham Station) and zone 3 (Hither Green). I cannot possibly put it better than Darryl did in this post that deserves a nomination for some suitable blogging award. Read it here. I agree with Darryl that this fragmentation of the London railway doesn’t work. London is one town, can we have someone with responsibility for pricing, timetables and routes please. We elect a Mayor of London, I think it’s just natural that he should have control on these matters, not some control on some, all control and all responsibility. The recent announcements about transports don’t really speak of joined up thinking and planning in the best interest of Londoners. You can just imagine the ballet of accountants and solicitors that on behalf of the baffling number of rail operators worked out who needs to provide what and how much to pay and to whom and in what way, what a headache. The cost of negotiations must be staggering, and the priorities will inevitably end up in the wrong order. If this byzantine pricing system inflicted on all of us is a symptom then the patient is in need of a cure. These are tumultuous days in South London, the new trains timetables have been announced and those that have realized that their trains will be soon reduced or cancelled altogether are up in arms. 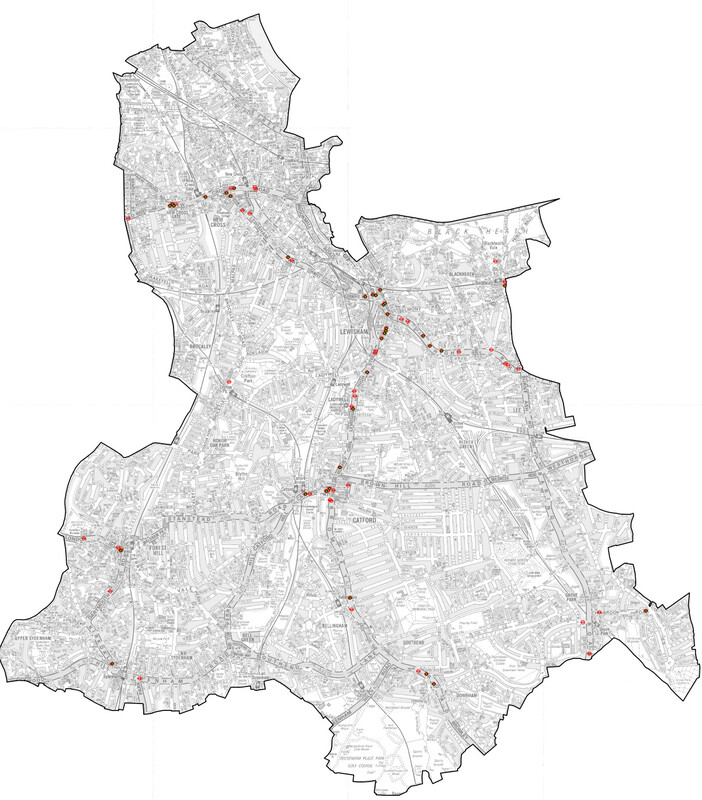 Trains through Hither Green have been spared from the chop, but other lines in Lewisham and beyond have not been so lucky and as the railway is a network, every cut affects the whole system. It looks like a gap in the investments needed for large projects like the East London Line have created a knock on effect with serious repercussions for some important railway routes across South London. Responsibilty is being shuffled between the various bodies overseeing transports, with the Government blaming TfL and TfL blaming the Government, the train operators saying that they just execute orders (we heard that already, didn’t we). The Victoria to Bellingham line that was planned to make up for the closure of the South London Line through Peckam Rye has been cancelled, the Victoria to London Bridge via Crystal Palace (touching in our borough the stations of Sydenham, Forest Hill, Honor Oak Park and Brockley) has seen a massive reduction. Blackheath commuters have been told that they will lose half of their rush hour trains. It’s quite obvious that the recent consultation on the South London Rail Utilisation Strategy (link) has been a very flawed process that has failed to recognize the importance of sustained good and improving public transports for the quality of life in the myriad of communities that compose London. Something serious must be done about it, there is widespread rebellion all around. Ironically that’s the real consultation, that’s what people think, and it’s coming through only now that the “consultation” is closed. Southeastern announcement that they’re cutting services through Blackheath after Government asked them to do so because they want instead to bump up numbers on the DLR shows that there is an urgent need of a rethink of the role of Government. people will switch back to car usage instead of public transport harming the environment, damaging air quality and nullifying a whole host of other policies and investments to counter precisely those trends. We desperately need strong political leadership to intervene in this process and provide guidance for a transport strategy that helps the economy, our daily lives and supports all those other policies that transport is a key part of. London is the birthplace of the railway, we live it and breath it. Weaken it and you weaken London itself. Besides the flagship infrastracture we need sustained services across the urban region of London, the millions of commuters that pay their ways don’t feel they’ve been subsidized at all and surely deserve better. This coming Thursday 12th November, at 7:30pm at the Tabernacle, Algernon Road SE13 7AT there will be a public meeting held by the Central Lewisham Action Group, a group of residents that opposes the current plans for redevelopment of the area often referred to as Lewisham Town Centre although currently this area is still mostly a transport hub with a roundabout. This promises to be a very interesting and lively meeting, many important issues will be discussed, I will be attending and very possibly say something too. Speakers announced so far are Libdem Councillor for Lewisham Central Andrew Milton and Fran Rogers of Transition Brockley. Rivers of electronic ink have already been poured on this subject but here’s a quick to recap of the main points to allow me to state clearly where I stand on this issue. There are two adjacent yet distinct main developments that are supposed to be built near Lewisham Station and that already have planning consent, these are the Lewisham Gateway and the Loampit Vale development. Besides these developments very close to these two there are other large blocks on the horizon and also a few others that have just been built. These developments would bring thousands of new accomodations, a large amount of commercial space, a leisure centre, a school, a new road layout, a new bus station and more. All in a relatively small area, with all the repercussions on the environment and services that a development of this scale creates. The Lewisham Gateway development should rise where today lies the roundabout plus quite a lot of land around it, edging the Citibank Tower on one side and including what today is the Lewisham Bus Station on the other side. Planning application for the Gateway development was agreed in April 2006, works have not started yet. The other development with planning consent is the Loampit development and I wrote extensively about it on this blog (link to posts on Loampit Vale). I personally strongly oppose the Loampit Vale development mostly because it includes a leisure centre that is not built to a size sufficient to serve both the existing local community and the newcomers that would populate all those new developments. There would be many losers, mostly among the current users of Ladywell Pool. This is a straightforward damage to the quality of life of the residents of Lewisham that use Ladywell pool that would have reduced access to swimming. I squarely blame Mayor Bullock and his uncritical supporters and associates for the inability to plan for sufficient leisure provision. Regarding the Lewisham Gateway I oppose that too, but for different reasons, one more mundane reason if you will is that to my eyes that’s plain ugly. Despite the best efforts of the architects it still remains a massive bulk, and this is due to the economics of the development, that burdened by an unusually high level of expenditure for the preparatory infrastructural work, to cover costs and allow a profit for the developers must include an enormous volume of built and no matter which way you turn it the bulk just doesn’t go away. To be more specific this development must pay for a new road layout to replace the roundabout so to create the space for the development, and that alone is 2 years of roadworks, then it must move some very large utility mains that run under the roundabout, move a river and a bus station. All this is mightily expensive hence the massive bulk. My main reason for opposing it though is that I am not convinced that the design of the new road layout is a good plan for Lewisham. I fear it will transform much of the centre in a massive near constant gridlock and that’s surely not my idea of a thriving town centre. During the years of planning for this project we were all told that this new system would not have had any negative impact on the traffic, there was an explicit firm guarantee that at the very least the impact would have been neutral, this guarantee was repeated at every stage of the process. Then when the study was finalized for planning consent the admission came that it would have been marginally worse. Now, even assuming that the admitted marginal worsening would have been acceptable the fact remains that the traffic model was done on the Gateway alone, without considering the impact of the other developments around it and so what we have is a traffic model that implies the same amount of built as today, which is a semi-desertic half baked retail park and employment area where there are supposed to be tall buildings all around and a few thousands people living in them, plus a school for 600 children, a leisure centre, a new parade of shops in front of the station. There is a lot of extra activity associated with this plan and this would have a serious further impact on traffic. Think about Lewisham roundabout at peak time today, well, it will be substantially worse. At the recent planning committee meeting on Loampit Vale the Head of Planning himself admitted that the traffic passing through the Lewisham roundabout is not traffic generated locally, that there’s little that can be done to alleviate it and that probably it won’t get any easier. And I ask myself, if the new traffic system is guaranteed to make traffic slightly worse than now, and this even without considering all the developments surrounding the Lewisham Gateway, what will this high rise traffic-ridden quarter be like to live in? The answer is that probably it won’t be that great. And so, because I don’t believe that we should build houses we wouldn’t like to live in, I oppose it. Now, as I already said, the Lewisham Gateway has planning consent, so whether we oppose it or not it doesn’t actually make any difference, but there is a concrete risk that the project derails without any external help, just because the numbers don’t stack up anymore, and 3 and half years after planning consent we’re now beginning to be quite close to the moment the planning consent expires. And if the Gateway wouldn’t happen then that land and adjacent large plots like for example Thurston Road could be at the centre of new planning considerations because the much trumpeted new Town Centre wouldn’t have materialized and a fresh thinking would be required. Likewise the Loampit Vale development may not happen, but that in my opinion is more at risk of delaying or losing some bits (like part of the social housing) than to derail completely. Anyway, it may not happen, but a degree of risk that the project derails exists, and for us Libdems it’s time to think about it concretely so that if after next elections we gain control of this Borough Council we can work on an alternative and of course we must start by listening around to what people would like to see there and what ways there could be to move the current scheme to a more desirable one. So, if you’re interested in these and other matters related to the developments at the fabled Lewisham Town Centre (schools for example) then you’d do well to attend this public meeting. Lewisham Station, c. 1900, passengers were already unable to use Oyster Cards! If you want to get lost looking at old pictures of the area you can’t do much better than visit the wonderfully named IDEAL HOMES: SUBURBIA IN FOCUS.